God chooses to dwell with His people as they journey through the wilderness and the go to the Promised Land. The way God does is through the tabernacle and the priestly system. The tabernacle was a temporary dwelling designed by God. It was a large tent that could be dismantled, transported, and reassembled. Various names are given to the Tabernacle in the Scriptures: Sanctuary, Tent, Dwelling, and House. It was a symbolical picture of how a Holy God will dwell with a sinful people. The Lord was particular with regards to the tabernacle. We read, “ And let them make me a sanctuary, that I may dwell in their midst. Exactly as I show you concerning the pattern of the tabernacle, and of all its furniture, so you shall make it” (Exodus 25:8-9). 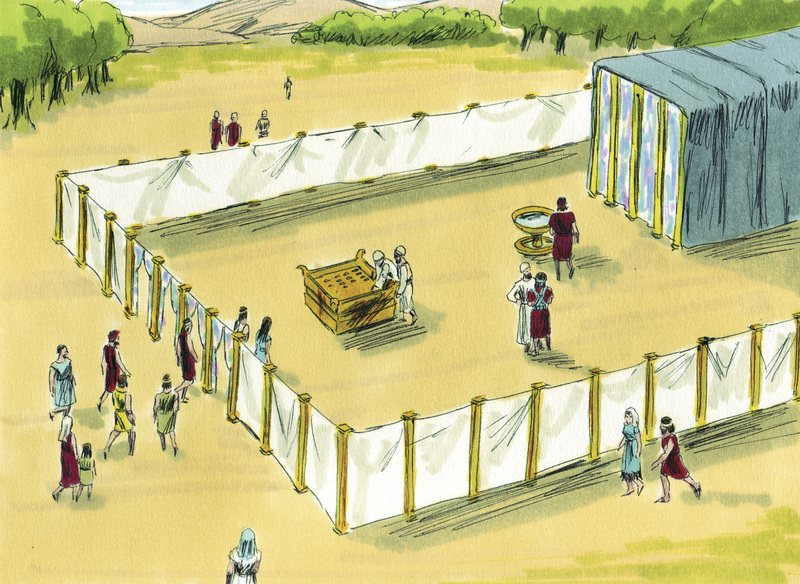 The actual Tabernacle was 13.5 M long, 4.5 M wide, 4.6 high. It was covered with curtains of blue, purple, and scarlet. They were covered with weather resistant goats hair, which was then covered with ram and badger skins. The tabernacle consisted of two rooms. The first room was the Holy Place. On the left was the lampstand, which was to burn continually, and on the right was the table for the bread of His presence (12 loaves of bread). Straight ahead was the altar of incense, which would be burnt every morning and evening. The back wall was a curtain leading to the second room. This room was the most holy place, also known as the Holy of Holies. Only the High Priest could enter once a year (Leviticus 16). Inside that room was the Ark of the Covenant (Ex. 25:10-16). This object was 1.1 m long, 0.7 wide, and 0.7 high. Inside of it was the Ten Commandments, a pot of manna, and Aaron’s rod. The tabernacle provided rich imagery pointing to the holiness of God, the sinfulness of man, and the grace of God. It demonstrated to the people how they could approach with God and abide with Him. Later on in the journey through the Bible, we learn that this tabernacle is a picture of Jesus Christ. He came into the world and dwelt among us (John 1:14; the word “dwelt” in that verse is literally “pitched His tent”). In Hebrews 8-9 we learn with great clarity how the ministry of Jesus Christ actually accomplishes what the tabernacle described in Exodus pointed to. The priesthood was to participate (in accordance with the specific instruction of God) in the tabernacle and the sacrifices. The priest functioned as a mediator. He mediated between Israel and God and God and Israel. Aaron was the first High Priest and his sons were to be the priests. They were to wear special garments. These garments distinguished them from the other Israelites and carried rich symbolic meaning. The High Priest was to wear different garments again. The priests were instructed by the Lord to follow carefully prescribed duties relating to the sacrificial system. The priesthood is discussed with great detail in Exodus 28:1-30:3.